The thick outer skin or covering that found on fruits, vegetables, meat, cheese, and other types of food. Fruits such oranges, lemons, watermelons, and pumpkins all have an outer covering referred to as a rind. Pork meat commonly has a thick tough covering on hams and some types of bacon that is known as the Rind. The firm thick outer coating found on various cheeses is also a form of a Rind. On some food items, the rind is considered an edible part of the food, such as pork, bacon, and watermelon when pickled. 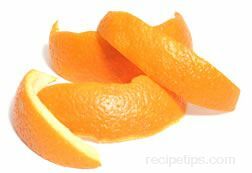 On other foods, such as oranges, lemon and limes, the Rind is often used as a garnish to add to desserts or serving plates for presentation purposes.